Yesterday you ate your turkey (and/or watched a parade, dog show or football game) and today you shopped until you dropped ... Now that all the “official” Thanksgiving activities are checked off and you are relaxing – this might be the perfect time to share family stories! I have been familiar with StoryCorps for a few years. The idea of saving our stories, given how many have been lost in my own family alone, has always “struck a chord” with me. 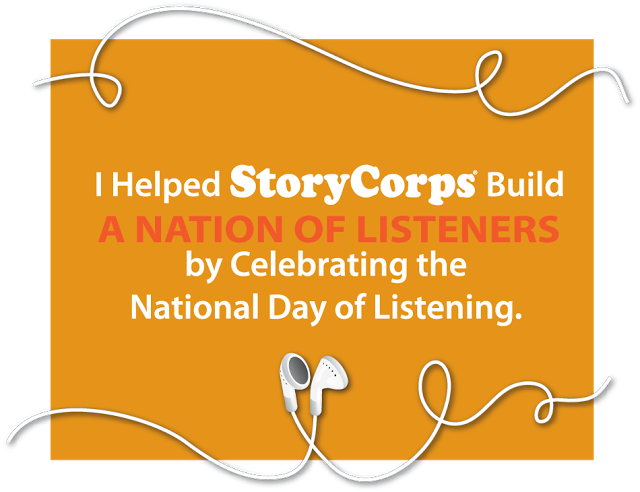 The National Day of Listening is a new national holiday started by StoryCorps in 2008. On the day after Thanksgiving, StoryCorps asks everyone to take a few minutes to record an interview with a loved one. You can use recording equipment that is readily available to you, such as computers, iPhones, and tape recorders. How you do it doesn’t matter! Everyone is also encouraged to post a memory to Facebook or Twitter or to tape a tribute on youTube or record an interview with a teacher or anyone else you would like to honor. At no cost, though donations would always be appreciated, one can record an interview of someone in your community and then share it via the Wall of Listening. This can be an opportunity to visit those in veteran’s homes, senior centers, homeless shelters, and other community centers to make sure that their memories are preserved for the future or just start with the family members with whom you have just shared a Thanksgiving meal! A Do-It-Yourself video and Guide are available on the site to help you. The FamilySearch Blog also shares some ideas as does Lowcountry Africana. And, nothing says that you have to wait until after Thanksgiving! Any day that you are with family is a great opportunity to record a family story for posterity! Did you record someone? What was the most special memory/thought they shared with you? Editor’s Note: Versions of this post were published in 2011 & 2013. Tomorrow Celebrate National Family Health History day (aka Thanksgiving Day) -- Create a Health Pedigree Chart! Though many of us think of tomorrow as Thanksgiving Day, it is also National Family Health History Day. As one gathers with family, this holiday (or any other family gathering) is always a good time to have this information available and current! Last year, creating a health pedigree has been making the rounds of many in the genealogical blogging community. This appears to have started when Nathan W Murphy (FamilySearch Blog) posted his Death Chart. Then a post by Polly FitzGerald Kimmitt (MGC Sentinal) Create Your Health Pedigree Here! discusses a really neat and simple tool produced by the Massachusetts Genealogical County (MGC) called My Health Pedigree. Though Upfront with NGS has discussed a similar idea previously, in Genealogy and Family Health History Go Hand-in-Hand! and Genealogy and Family Health -- Don't focus so much on the deceased that you don't pay close attention to any trends in how your ancestors died!, the nice thing about the newest effort is that it neatly piggy-backs on the pedigree charts we already make and the MGC created a tool that is so simple to use! Additionally, it’s simple to use and it also allows you to include information on siblings (not just your direct lineage). There is great value to understanding the bigger picture about how family members have died. I have also seen where individuals have added in the age at death. I think there is great value to this additional information – not so much for accidental deaths and for those conditions which may be more hereditary in nature. And, obviously, you can extend the pedigree concept further back in time to identify any health trends which may become more noticeable with more data. Did you something really strike you as you created your own health pedigree? Special Report: Loved Ones Lost, Letters Found tells of some letters found in a basement and the successful research to identify a living relative of the letter’s authors, 3 brothers. The letters have offered the family a new snapshot of their Lanthier history, and at the same time, it's brought them together to remember these three men- three brothers- who served their country. Do you know of a similar success story where letters, a family heirloom, photographs, a bible, or some other piece of memorabilia? These world-wide stories all give us hope that maybe the oft-mentioned and yet not in anyone’s known possession bible might someday turn up. There was one occasion where I was contacted by someone, based on a family genealogy posted on my website, about letters for my brother-in-law’s family. The person wanted to see that the letters got to a family member and so I drove out to a meet point, was given the letters, and we both went our separate ways. I then gave the letters to my sister and they are now a treasured keepsake. Editor’s Note: Social Media played a part in some of these success stories! I’m looking for some help with a project I’ve been working on. I’m trying to catalog all cemeteries established for residents of asylums, poor farms, orphanages, prisons, etc. – in other words, cemeteries for the unclaimed. Most of the people laid to rest in these cemeteries were forgotten in their own lifetimes, and often the cemeteries themselves are abandoned or neglected. Please check out my website: http://institutionalcemeteries.org/ and check in particular the cemetery listings near you. Red icons mean that I still need GPS coordinates for the cemetery, and yellow icons mean that the listing of burials on Findagrave is not complete. If you have more information about one of these cemeteries, or one that I’ve missed, I’d love to hear from you. Together we can preserve a record of these forgotten burial sites. Many many families had family members who ended up in an institution, for one reason or another, and many ended up dying in one. Many are buried in unmarked graves ... long forgotten. To use this resource, click on the appropriate region -- Midwest, Northeast, Mid-Atlantic, South, Southwest or Northwest -- to see that regional map. Click on any icon and you will see a bubble that comes up. The bubble will include a link to the appropriate find-a-grave page and also to an informational page with AKA names, a statement about the completeness of the find-a-grave information, location, and other details. This is a neat project and an important one. Medieval Parchment Doodles and Creative Repairs ... who would have expected? Sometimes you don’t think of something until someone mentions it. That was certainly the case when I recently read two items about Medieval parchment on Colossal – Art, Design, and Visual Culture both by Christopher Jobson. I like reading pieces like this because they get me thinking outside-the-box as I look at documents. Back in the day, they didn’t have staplers, paperclips, whiteout, erasers, glue, or many of the other tricks of the trade that we use to repair issues in documents. So, what did they do? I added in the doodling link as I have come across such myself when researching in court records and in private manuscript collections. You will be looking at some serious papers and then all of a sudden see a doodle. I find that when I see these, they immediately “humanize” the individual in my mind. Even our ancestors didn’t just work, work, work while on the job. It makes you wonder what they daydreamed about? The same things that we do? Sometimes, the doodles are clearly those of a child. Did the parent step away from his desk and a child entered and wanted to practice writing or drawing? Or did the clerk grab a sheet of paper not realizing that the reverse side was already scribbled on and just opted not to rewrite the official document? It also made me wonder if my kid’s doodles (their school papers seem to be full of them) mean that someday an important document in the future will contain their scribbles? It also got me thinking, if we move more and more to a computer-based virtual world and paper continues to be passé, can one really doodle electronically to the same affect? Will a window into who we are be lost? So, these types of articles both give me something to think about regarding ancestors and historical documents while at the same time giving me food for thought about the future? Have you seen a really neat/creative document repair or correction? Have you come across doodles in the most unexpected places when doing research? Are there any conservators amongst our readers? Do you know of any neat resources that talk about how documents were repaired through time? A 110 Year-Old Still Operating Light Bulb -- Does Anything Held By Your Family Have That Kind of Longevity? I found it fun and informative to read, The 110 Year-Old Light Bulb That's Never Been Turned Off. Yet this 110 year old light bulb is proof of what one person can achieve. It's very existence proudly states, I am still here. It is proof that there is far more to all technologies then we can ever imagine. It is proof that true history matters. If only to pay tribute to the genius that got us so very far. The article is as much about this particular light bulb as it is about conditions of the time and the value to both the idea of and creation of something called the light bulb. Imagine – any electrical appliance that you have that is still be used 110 years later. In fact, think of any powered or even manual appliance. I know that I only have things like a tea set and a few plates which I know to be at least 110 years old. And, that’s it. What about in your house or family. Are there any items that are still being “used” (not just brought out for show and tell) which have been around as long as this light bulb has been operating. Editor’s Note – Thanks to Thomas MacEntee via his Hack Genealogy FB page for posting about this. Family History Bingo -- Have Fun With The Family This Holiday Season! The holidays are approaching and often a time of family gatherings. I read an Ancestry.com blog post Creative Ways to Get Your Kids Excited About Family History Month – Part One which had some neat ideas. Though, I would change the title to Creative Ways to Just Have Fun With Family History! I had a blast making the above version of Family History Bingo. What a fun way to walk down memory lane. It will be even more fun when I play it with my kids (well young adults)! Since I am publishing this online, I have only used photos of those who are deceased. Obviously, for your own family you can include children, parents, cousins and other living relatives. I then created a version with duplicate photos of people. Can you “match” the photos for each person? And, since 25 spaces isn’t divisible by two, there is a third image for one person. Can you match them? Post your guesses as a comment (FB or at the blog) or send an email to [email protected]. In a few days I will post a follow-up post with the answers of who they are and where they are in my maternal family tree! You can access ‘Genealogy Corner’ here. Many of the listed items are indexes. Copies of the actual documents can then be ordered with details on cost and how to do so provided. I haven’t thought of Collin County in a few years though it has a special place in my heart as the birth place of my two “Texan” children! Barney the purple dinosaur was all the rage around the same time. Past Best Practice Award Winners from NACRC are listed here. Interestingly, Collin County also received one last year for Marks, Brands and Tattoos. You can access the currently registered Marks & Brands here (covers 2011 to the present). Really neat! Archival best practice awards are a win-win. Normally they involve something which allows the professionals tasked with managing records to be more effective and efficient and outcomes includes safer and often more accessible records which we love as family historians! Are there other award-giving institutions for practitioners and the repositories of most interest to genealogists? Editor’s Note – Thanks to Thomas MacEntee via his FB page for posting about this. Editor’s Note – I added a few comments in brackets. Without panoramic photos, digital cameras capable of shooting still images and movies, and more, it used to be challenging to imagine what a place/community/town/city looked like at a particular moment in time. One had to rely on a few still images, many words, and possibly a few maps, to try to visualize what an area may have looked like at the time when our ancestors lived there. A neat and recent project, Visualizing the Past, attempts to do just what has not been possible – visualize a locale as it looked at a particular point in time. Over the past several months, the DSL(*) has been collaborating with the Library of Virginia, and Maurie McInnis, Vice Provost for Academic Affairs and Professor of art history at the University of Virginia on the To Be Sold– Virginia and the American Slave Trade exhibition. Read more about the exhibition below. Our role in the project was to create a 3D visualization of Richmond in the early 1850’s. The 3D visualization is used to help visitors envision Erye Crowe’s journey through Richmond, and experience the slave trade through his paintings and engravings. The models’ intent is not to replicate every detail of Richmond in 1853, but provide a sense of the architectural styles and atmosphere of the city at the time. Another extension of the above project is discussed in Richmond Then and Now. A summary of projects can be found here. All of these are helpful to the research we do. As a very visual person myself, I am always appreciative of any tools that assist me in visualizing a place and period in time. Are you aware of other 3D Visualization Projects which can help us better “see” the world our ancestors lived in? Editor’s Note: Other Upfront with NGS posts about 3D modeling. + Can Digital 3D Modeling Preserve the Past and Present for Future Generations? What Can We Do to Make This Happen? (*) DSL stands for the Digital Scholarship Lab at the University of Richmond. Limerick (Ireland) Trade directories, 1769-1976 now available. You can search by trade, directory, time period, surname, address etc. I have one known collateral ancestor, John Walker Nelson, who lived in Limerick working as a Watch Maker for a few years before marrying and moving. He is listed in the 1877-1884 directories on Westland Street. Searching for someone who might have been involved in a court case, 1881-1980 in Seattle, King County, Washington? If so, consider submitting a query to the Seattle Genealogical Society (SGS – free for members and a fee for nonmembers) for a search in the King County Court Cases Index, 1881-1980. Cases pertaining to Divorces, probate, name changes, guardianship, bankruptcies, commitments and more. New York University has introduced Arabic Collections Online. This mass digitization project aims to expose up to 15,000 volumes from NYU and partner institutions over a period of five years. The landing page is in English on the left and Arabic on the right. 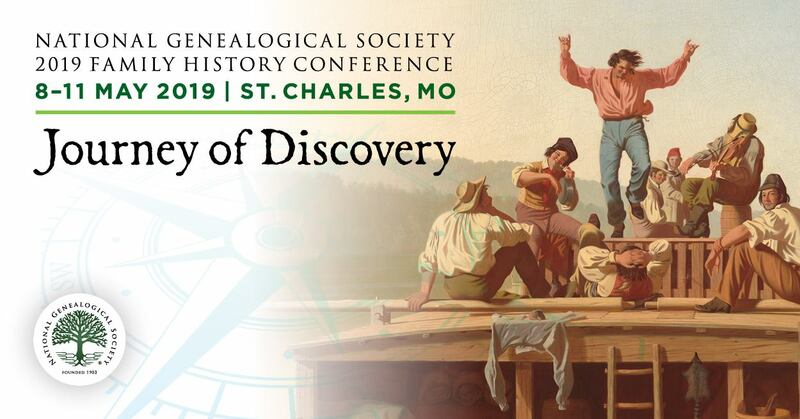 I suspect that many of the titles won’t be helpful to genealogists directly and possibly indirectly?!?! Looking for the final resting place for a Civil War Veteran? Check out the Sons of Union Veterans of the Civil War Grave Database. The database includes both Union and Confederate soldiers and tells from what state they served in, what branch of service, and where the cemetery is located. When you click on an individuals name, a detailed information card comes up which will give death date, possibly birth date, may have information on cause and location of death and information on the cemetery. Over 90,000 people volunteered for the British Red Cross during WWI. Did one of your family members volunteer? Names are being added in alphabetical order so if you don’t see a surname of interest, it may mean that the project hasn’t yet gotten to that letter of the alphabet. Christ Church in Philadelphia has Vestry minutes (1717-1815), baptisms, marriages and burials (1709-1900+) and pew rent registers (1778-1785) now searchable via an on-line database. The United States Geological Survey (USGS) launched a Historical Topographic Map Explorer, allowing one to easily pore through the agency's expansive collection of more than 178,000 of the USGS's maps dating back to 1884. When you enter a city, you then click on the map and a timeline of available historical maps is revealed. Select a map and you can then see if overlaid on the original map (you can adjust the transparency) and even download the map. Very cool! Editor's Note: 15 Nov 2014, Corrected date range for King County Court Cases Index item.